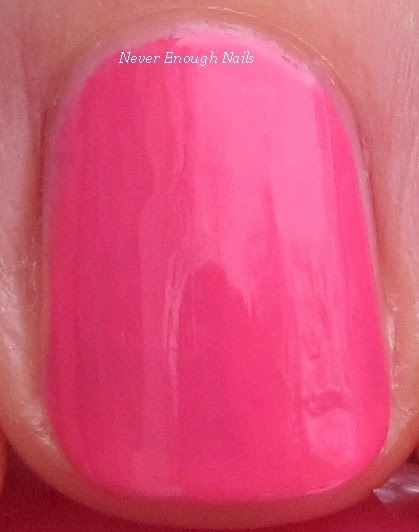 Never Enough Nails: SinfulColors Flirt with Hearts for Valentine's Day 2015 Swatches! SinfulColors Flirt with Hearts for Valentine's Day 2015 Swatches! SinfulColors has a great little collection of 8 polishes out now for Valentine's Day and I have four of these cuties for your viewing pleasure today! These are perfect little treats to give yourself for Valentine's Day, by the way! First up is SinfulColors Daredevil, a hot pink with subtle blue shimmer. This is a nice neon pink, not retina searing neon, but still nice and bright. The blue shimmer is visible in certain lights, but it mostly just adds a little dimension to the finish. This is three coats of Daredevil. It has a nice formula with a good consistency, not too thick or too thin. Like all neons, it dries to a semi-matte finish, so I did use a nice shiny top coat to finish it off. SinfulColors 24/7 is a medium blue-toned pink creme. It's not quite a bright bubblegum, it's a shade or two darker than that. Kind of a more grown up bubblegum. It's a nice shade of pink that will be flattering on a variety of skin tones and it's great for spring, so grab this if you don't have something similar already. This is two coats of 24/7. It applied well and was nicely opaque. No complaints about this one! SinfulColors Love Sprinkles is a brand new limited edition glitter topper. 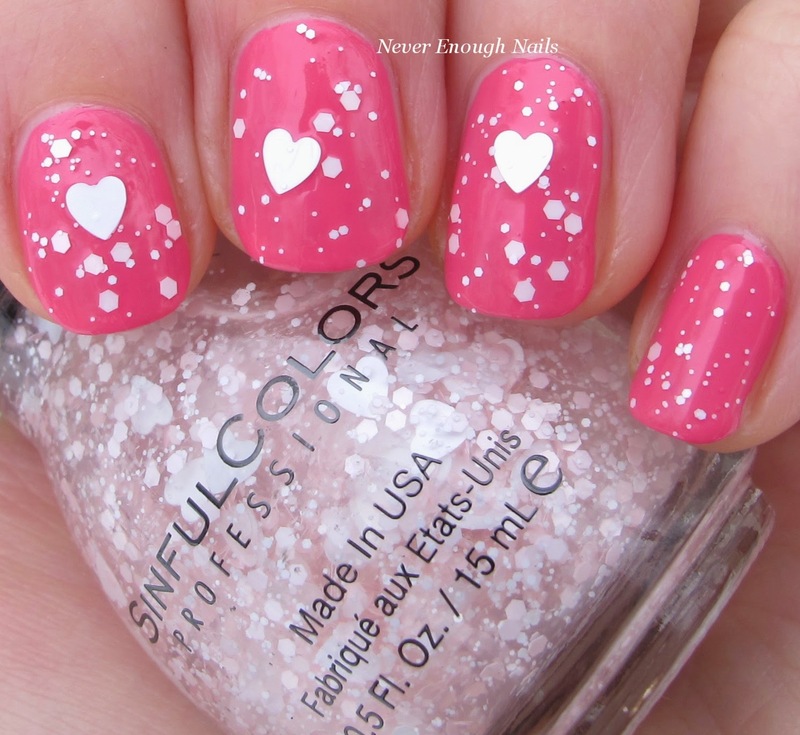 It features pale pink and white glitters with large white heart glitters in a clear base. It looks adorable over any color polish and instantly makes your mani Valentine's Day festive! Love Sprinkles was pretty easy to apply. The glitter came out readily, even the heart glitter. I kind of pushed the hearts around to position them, but otherwise it was pretty unfussy for a glitter topper like this. This is 1-2 coats of Love Sprinkles over 24/7. I say 1-2 because most nails have one coat, but I dabbed a few more glitters onto two of my nails for good measure. SinfulColors GoGo Girl is a juicy deep red jelly. SinfulColors calls it "candy apple red" and that is perfect- it really makes me think of a candy apple. I know GoGo Girl is not new and it is a lot of people's favorite red polish, but it's new to me! I am in love with it already and it may quickly become my HG red jelly. This is three coats of GoGo Girl. The formula was good, maybe a tad thin, but not too problematic. It is fairly sheer on the first coat, thanks to it's jellyness, but it's buildable. And here's Love Sprinkles over GoGo Girl with a matte top coat. Love this!! I just found my mani for Valentine's Day! The SinfulColors Flirt with Hearts collection is available now for $1.99 each at Walgreens, Rite Aid and other mass retailers. Pick one up to wear on Valentine's Day or to give yourself (or a friend) a nice treat that day! For more information about this and upcoming SinfulColors collections, check out SinfulColors.com, facebook.com/sinfulcolors, twitter.com/SinfulColors_NP, and instagram.com/sinfulcolorsprofessional. Me too Ananka! I'm wearing it tomorrow for sure!